By adopting a dog or cat from Rudozem Street Dog Rescue, you are helping to save the life of a animal which may have suffered abuse, hardship or would have died on the streets. Each Adopter is asked for a donation towards the cost of transport. This donation does not cover all the costs incurred, but helps ensure RSDR continue to do their rescue work in saving and caring for more street dogs. 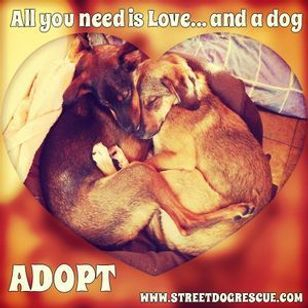 Before deciding to adopt from RSDR, we ask you to read the following brochure about our animals to see if you are committed to taking on a rescue animal from the streets. An RSDR dog/cat is a rescue animal that might have suffered or seen much abuse on the streets in Bulgaria, and has been taken to the RSDR shelter. He/she has been slowly rehabilitated over a period of time, and has become used to the security of shelter life & the humans that look after him/her. They are special animals that have endured much, so need special time and consideration by our adopters, when settling into their new homes. Each adopter is asked to make a donation towards the cost of transport. This cost will vary depending on your country of destination. Each adoption trip costs RSDR approximately 3000 British Pounds for the use of the whole transport vehicle. RSDR needs a minimum of 12/13 dogs per trip to cover the transport costs. If there are not enough adoption numbers on a transport, the adoption trip may need to be postponed until there are enough numbers. The animals at RSDR will only leave the shelter on transport once they have been adopted. RSDR's general policy with rehoming to a family with children, is that we would not rehome animals with children under the age of 8 years old. We will however make the odd exception to this rule in exceptional cases depending on the level of experience of the family and if we have background information on the animal being good around young children. Also we do appreciate some children will have grown up with animals and have a better understanding of them and how they need to be treated. So if we know the children and dog background, and the family to be experienced with dog body language, on occasion we may make exceptions, but in general we will turn a home down with young children under 8 years old. If you have a child or children under 8 and you feel you can demonstrate a significant level of experience of caring for a dog in your family setting, please do fill out an application form. We review all applications on their merits, but feel we should emphasise that this is a high bar which means that we do refuse a large number of applications. All our dogs and cats travel by road with a registered TRACES pet travel company under TRACES imports/exports on our scheduled adoption trips we have every 1-2 months. The dogs usually will leave the shelter in Bulgaria by road, on a Friday and arrive in the Netherlands, Belgium or UK on a Sunday depending on travel/weather conditions/ and other circumstances which are out of RSDR control). For animals travelling to the UK, with the TRACES scheme being implemented for rescue dogs and cats, after entry into the UK, the animals will stay at a destination address for 48 hours and may be checked by a AHVLA vet during the 48 hour period. 1. To adopt a dog or cat, please go our Netherlands Adoption Website to read about the adoption process in the Netherlands and Belgium. 1. Press here to view the UK adoption Process and to fill out a UK application form. 1. To adopt a dog locally in the Rudozem area in Bulgaria please fill out our UK application form above (in english) - but note Bulgaria under country. With the implementation of commercial travel of imports/exports of TRACES in Europe, RSDR are currently only doing adoptions to Belgium, UK and the Netherlands where we have established adoption teams, and where applicants can undergo a home check and interview process. At this stage we are not doing adoptions to other countries except for those mentioned.